Theoretically, when a degradation reaction is known to follow known fixed-order kinetics, its parameters can be determined from two final concentration ratios at two constant temperatures by numerically solving two simultaneous rate equations. Such a solution, however, may require fairly accurate initial guesses that are difficult to assign intuitively. Nevertheless, they can be estimated by manually matching the two experimental points (shown in red and blue) with their corresponding degradation curves using Mathematica&CloseCurlyQuote;s Manipulate function. Once found, they can be used either as initial guesses or as parameters themselves. 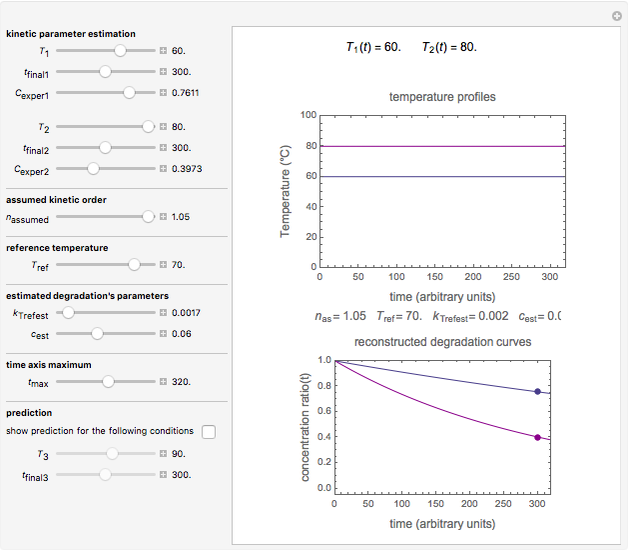 This is shown with user-entered endpoints assuming first-order or approximately first-order kinetics and showing how the retrieved parameters can be used to predict the concentration ratio at different temperatures after different times. Consider a degradation reaction of a heat-labile biological compound, for example, a vitamin or pigment, following assumed fixed-order kinetics ( ), where the temperature-dependence of the rate constant follows the exponential form , where is the rate constant at temperature . As has already been shown, this simpler model can replace the traditional Arrhenius equation without sacrificing the fit . When the compound is exposed to two constant temperatures and for sufficiently long times so that the come-up and cooling times' effects are negligible, the two corresponding degradation curves can be modelled by and . The final concentrations and are the solutions of these two rate equations for times and , respectively. This gives two equations and with two unknowns, and . If the final concentration ratios have actually been measured, then one can solve these two equations simultaneously using FindRoot and extract the values of and . 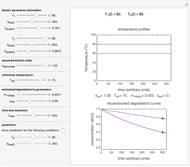 Once calculated, these parameters can be used to reconstruct the entire degradation curves of the two temperatures and predict other temperature histories, isothermal or nonisothermal. 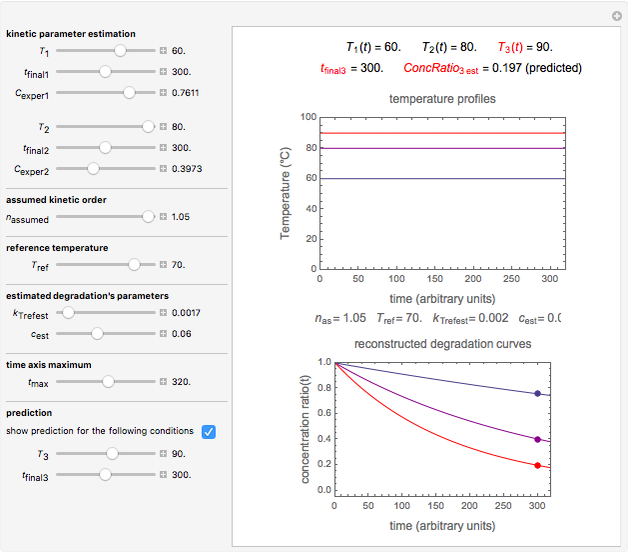 In this Demonstration, enter the two temperatures and , corresponding concentration ratios and at chosen times and , the assumed reaction order ( ), and chosen reference temperature between or equal to one of the two chosen temperatures. Once these are set and displayed, one tries to match the two shown degradation curves with the two chosen points by moving the and sliders. The match can be improved by adjusting the numerical values of these two parameters displayed to the right of the sliders. When a satisfactory match is obtained, the corresponding parameters' values, which are displayed on top of the bottom plot, can be used as the initial guesses for solving the equations or considered as estimates of the parameters' values themselves. 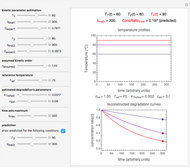 In that case, by checking the "show prediction for the following conditions" box, you can estimate and display the concentration ratio at any temperature and time entered by the and sliders. Not all time-temperature-concentration ratio entries allowed by the program must have two matching degradation curves. Some entries may reflect experimental errors, a reaction kinetic order outside the permitted range, or nonlinear kinetics. M. Peleg, M. D. Normand, and M. G. Corradini, "The Arrhenius Equation Revisited," Critical Reviews in Foods Science and Nutrition, 52(9), 2012 pp. 830–851. doi:10.1080/10408398.2012.667460. Mark D. Normandand Micha Peleg "Prediction of Isothermal Degradation by the Endpoints Method"